November 13, 2014 February 10, 2016 ~ Sara W.
This past weekend, I had the opportunity to speak at one of our church services on the topic of “be[ing] of good cheer.” Since the topic happens to echo virtually the whole premise of my blog, I thought I would include a large portion of the talk here as this week’s post. I hope you enjoy it! When I was in High School, I recall having a lot of fears and anxieties. Most of my fears were of the unknown. One fear in particular was the end of the world. At the time, there were three movies out that were about the end of the world. They terrified me. I found myself preoccupied with the “how” and “when” the world might come to an end. I also remember this specific time where I hoped that nothing bad would EVER happen to me. I had an irrational understanding of how life worked. I thought a life of roses and lilies would be the key to my happiness. Thankfully, I’ve learned much since those high school days. I’ve learned of all the beauty that comes from being faithful and enduring well through trials of all shapes and sizes. 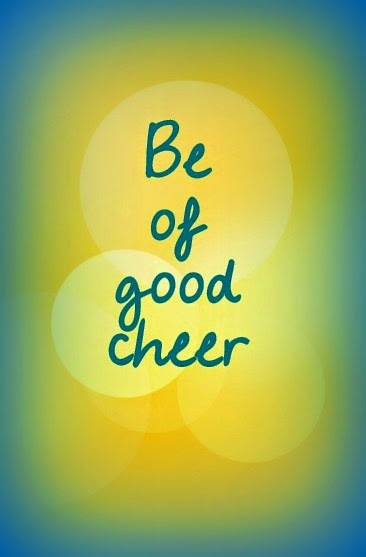 In the Bible, the term “be of good cheer” is mentioned eight times. Never once does the scripture read, “Be of good cheer and enjoy your life of roses and lilies and no problems.” In fact, it’s quite the opposite. In reading through them all, my take away is that we are asked to be of good cheer in times of adversity. I have overcome the world. Recently, for me, it’s been my health. Nearly four months ago, I gave birth to our fourth child. One week and one day later, I suffered a significant stroke. Thankfully, I’ve had a full recovery. I had a mini-stroke previously, but this experience was much more disturbing. Upon reviewing my MRI, it was found that I have a tumor in my optic nerve. At this time, the tumor is considered stable, but obviously it weighs on my mind (pun intended, because humor helps). The reality though is that I will likely have another stroke, there is a potential for the tumor to grow and I may ultimately lose my sight. The tumor and the stroke are completely unrelated, so the finding of the tumor was considered a serendipitous find. I told you all of that, to tell you this. Shortly after my stroke, I had a chance encounter with an older gentleman from my church. I can’t remember the exact details of our conversation, but the premise of the conversation changed my health fears to peace. I had shared with him that I had had a stroke. He informed me that his late wife had also experienced a stroke. He then shared with me all of the significant and challenging callings (volunteer-based duties) she held, prior to her passing, in the church post-stroke. While I had never met this woman, I could sense of her devotion to the Lord. I knew she must have been a great blessing to those around her. I knew this because the gentleman I was speaking with had the light of Christ in him and he spoke so highly of his wife who had passed away some time ago. Every time my heart starts to fill with fear as to what might happen to my health in the future, I reflect on this conversation and realize that if the Lord has a work for me to do, he will provide a way to make it possible. If this man’s wife was still able to serve the Lord despite her health issues, then certainly so can I. This knowledge immediately dispels my fears and brings me peace. I now see how foolish it was for me to believe that a world of happiness was founded upon a life without trials. Instead, I’ve learned that happiness is found in having faith in our Savior in all situations and watching rich blessings come to pass. We are not here to live this life in misery. Another way to help live a life based on being of good cheer is having perspective. Perspective is one of the best ways to endure trials more joyfully. I learned this firsthand when my mom passed away from cancer six years ago. I had to hold on to the eternal perspective to help get through the day to day. Prior to her passing, I lived in fear of what my life would be like without her around. Once she did pass, I was carried through the trial with strength beyond my own and held on to the knowledge that I would see her again. Having an understanding of the bigger picture and a surety that I would be reunited with my mom again brought me great comfort and joy. A feeling of joy that seemed near impossible when I first realized I would lose my mom at a young age. Camille Fronk Olson put it simply, “The more we know the Savior, the longer our view becomes. The more we see His truths, the more we feel His joy.” And what joy I have felt. I truly believe that being of good cheer manifests itself in our lives through faithfulness to the Lord, optimism, and believing on His word and the eternal plan which has been laid out for us. This is the recipe for living a life of good cheer no matter the circumstances. This is the recipe that no longer has me even wishing for a life free of trials and tribulations. Now, I hope for a life that I may endure joyfully.